Roller Shades making a comeback! Roller shades, as reinvented by Hunter Douglas are making a huge comeback. With fresh modern styling, new design options, and several lifting systems to choose from, the traditional roller shade is now better than ever. There are hundreds of fabrics to choose from, ranging from sheer to opaque, casual to modern, grasses to silk. 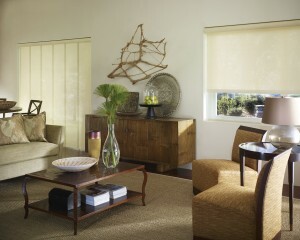 There is a shade to suit any taste or decor. 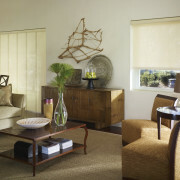 Fabrics are available in varying opacity to optimize light control and privacy. And with the Hunter Douglas ‘Harmony Program’, many popular fabrics and colors are available to allow the same fabric to be used for both vertical and horizontal applications, e.g., to match window treatments in a room with both windows and doors. Three lifting options are available: a continuous beaded cord loop, a cordless system with a spring mechanism, and PowerRise, a battery-powered wireless control that can be programmed to open and close on a schedule of your choosing. Hunter Douglas has also introduced the Dual-Roller Cassette that allows two shades in a single unit to be operated independently. Email or call for a complimentary in-home consultation and estimate. Periodic cleaning of your custom shutters is essential if you want them to last for years to come. 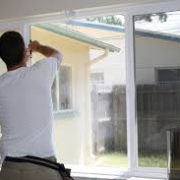 The more often you leave your windows open, or if you live close to a freeway or heavily trafficked road, the more frequently you will need to clean them. For periodic cleaning, dusting or vacuuming is usually sufficient. For dusting, avoid using a feather duster, which really just moves the dust around. Static-electric cloths work quite well, as do soft brushes that hold on to the dust. 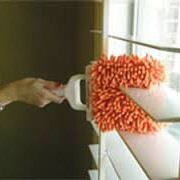 A vacuum cleaner with a soft brush attachment that fits between your louvers also works well. Using a vacuum, I usually start on the front of the shutter. Using the tilt rod, position the louvers in the up position and vacuum all the panels. Then put them in the down position and vacuum again. Then I open the panels. Do the same thing on the back side. Once a month should suffice. If more thorough cleaning is needed, you first need to know what material your shutters are made from. There are three types of shutters: Wood, Composite, and Vinyl (plastic). Vinyl shutters, which are essentially hollow plastic, are the least sensitive to water and that is why they are often found in bathrooms or over sinks where moisture is common. With vinyl, the entire shutter can get wet. Some vinyl shutters even have loose-pin hinges, which will allow you to lift the panels right off their hinges. If you can remove the panels, you can take them outside and hose them off, or put them in the tub or sink to clean them. If they aren’t easily removable, just use a soft cloth with warm water and a mild detergent. Dry them off and you’re good to go. Composite shutters are usually okay to get wet, but only to a point. You can use the same technique as for vinyl, but be sure to dry them completely. Wood shutters are either painted or stained and are very sensitive to moisture. Never allow them to be damp or wet for long. If allowed to stay damp/wet for too long, the louvers or tilt rods may become warped or the finish may start to crack or deteriorate. If absolutely necessary, you can wipe them with a damp cloth. Just make sure that you dry each panel thoroughly. But if you vacuum or dust your shutters on a regular basis, you won’t even have to worry about using a damp cloth to clean them. For all shutter types, NEVER use furniture polish, Windex, or any harsh cleaners on your shutters. If there is a spot issue, the only thing you should use is Simple Green, starting with a dilution and only using it more concentrated if the dilution doesn’t work. Then wipe clean using a cloth dampened only with water. Make sure your shutters are completely dry when done. If you have housecleaners…make sure they know not just how to clean your shutters, but how to properly open and close your shutters. The number one reason why the staples connecting the louvers to the tilt rod come loose is because someone grabs an individual louver to tilt the louvers, or they pull on the tilt rod to open the panel. Both put a lot of stress on the staple connecting the louver to the tilt rod. Open the shutter panels by using the side stile. Tilt the louvers by using the tilt rod. The tilt rod is just that…to tilt the louvers. Remember…shutters are your friend….take good care of them and they’ll hang around longer! Always tell your contractor if you plan to have window treatments installed. A good contractor/window installer will know what should be done in order for the best-looking, most functional window covering to be installed correctly and professionally after the fact. With retrofit windows you most likely will have less depth to inside mount any type of window treatment…especially shutters. Outside mounting is always an option, but it’s good to know this beforehand. If you are planning to install blinds/shades, and have enough depth for an inside mount, have your window contractor install trim around windows. If you plan to install shutters, it is best to have your contractor NOT install any trim. Most shutter manufacturers have their own trim/framing that comes with the shutter. Also with shutters, any sills that you have put on should be extended far enough that it will go past any shutter frames. If you think you would like to install shutters, it is best to purchase windows without grids, or with ones that are removable. Shutters often look too busy over windows that have grids. Kitchen or bathroom windows for which stone or tile will be installed within or around the window may affect which window coverings can be installed. Only a few products are available with cutouts. Likewise, if you intend to install shutters, it’s best to consult with a shutter installer before the tile or stone installation is completed so the contractor will know how best to finish the stone around the window. We are happy to work with your contractor/window installer to ensure that your new window treatments will be able to be installed correctly and professionally.